A 1 year course designed to help you push your work from 2D into 3D and back with paper cuts, folds, found materials, joins and collage in a playful and non-judgemental space. It will challenge you to cross perceived divides between two and three dimensions or fine art and applied art, explore the relationship between form and meaning / image and narrative and allow your practice to become more experimental, open and self-aware. The practical, studio based sessions will include specialist workshops in bookbinding, architectural models, toy-making and boxes. With the skills you aquire you will design and carry out your own visual projects with a more highly developed understanding of your practice and how to feed and develop your own work. Print activity on the course will be kept deliberately low tech to make the processes accessible to those who have no previous print experience. 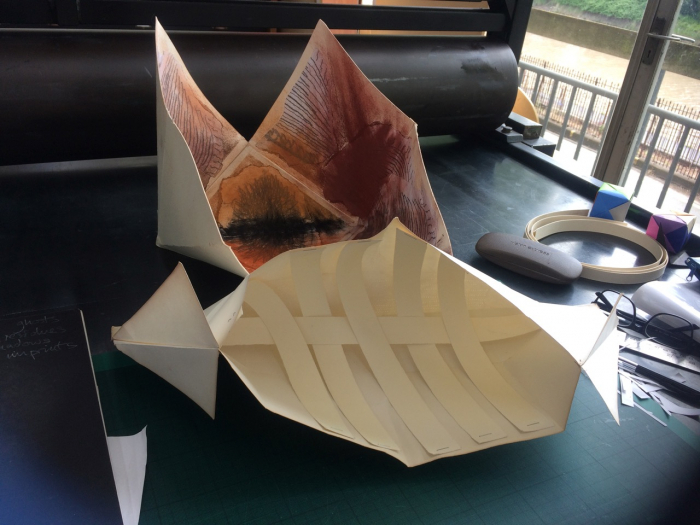 Course participants are encouraged to cherry-pick their own workshop choices to supplement the programme with a 10% discount on all other courses running during the year at Spike Print Studio and a 50% course in Papermaking with Elaine Cooper.